Best for space-limited applications, best in class performance, high reliability and low noise. 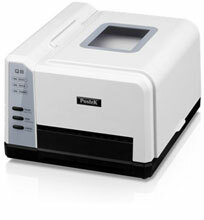 The Postek Q8/300s appearance and small footprint address your space limitations. Featuring one of the most advanced industrial microprocessors, the 32 bit embedded ARM CPU, with 2 MB Flash Rom and 8 MB SDRAM, the Q8/300s printer can achieve 4ips maximum printing speed.